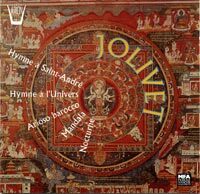 Description: Two 15-minute organ works (1961 and 1969) give us the Jolivet of the Danses rituelles: dionysiac intoxication, mystical communion with the powers of the earth, sweeping onward toward dazzling and grandiose climaxes. The brief, ethereal hymn for soprano (1947) and the ten-minute cello sonata (1943) are in the composer's early, conservative style, with affecting melodies and heartfelt emotion while the 1968 Arioso, written for Maurice André, falls somewhere in between. Daniel Roth (organ of Saint-Victor Basilica, Marseilles), Dany Barraud (soprano), René Périnelli (trumpet), Pierre Pénassou (cello), Jacqueline Robin (piano). Original 1996 CD release.